The Super Light 2 is the perfect travels scooter. 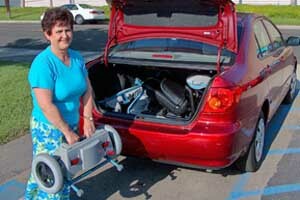 This scooter will hold up to 250 lbs., yet is light enough to easily take apart and transport in small car trunks. 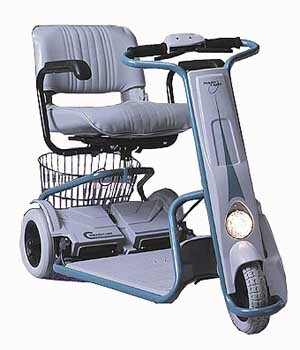 The Super Light2 is unique in that the sturdy tubular steel frame is high strength, yet the total weight of the scooter, with batteries is only 87 lbs. 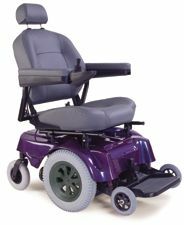 Remove the seat and the base of the unit breaks into 2 pieces, with the heaviest piece only 24 lbs.!! This makes the Super Light 2 the perfect scooter of choice for vehicle or airline transportation. The super Light 2 also offers 2.9 inches of ground clearance, more than most travel scooters. The larger 10" x 2" tires will allow the user to travel over light grass and packed gravel. This unit comes standard with rear basket and front and rear lights. Total weight - 87 lbs. Weight without batteries - 72.9 lbs. heaviest piece ONLY 24 lbs.!!!!! The Super Light 2 breakdown is easy! Simply lift up to remove the seat, slip the rear basket off. Lift the battery cover and unplug the batteries, remove both. Release latch to remove tiller with front wheel. Easily Breaks apart into 5 easy pieces. Heaviest Piece 24 lbs.!!! 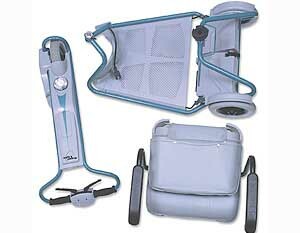 Lightweight, durable and easily removable folding seat. Wheel Size - Front and Rear 2" x 10"
Tires are 10" x 2" with a 2.9" ground clearance. Easy to operate delta type tiller offers easy of use for those with poor dexterity. Built in carrying handles and grips on bumper and tiller for easy lifting. Weight w/o batteries 72.9 lbs. Whisper quiet, smooth ride with light steering. Easy to disassemble with heaviest piece only 24 lbs.